A three-act comedy, Synge worked on The Well of the Saints from the winter of 1903 to its opening in May 1905. He reworked it for a revival at the Abbey in May 1908. He drew on the reputation of a well to cure blindness found on Arainn, the largest of the Aran islands, the story of which he heard from an old blind storyteller, Martin Conneely. He also drew on a mediaeval french farce in which a blind man and a cripple are cured by an unsought blessing from a saint. 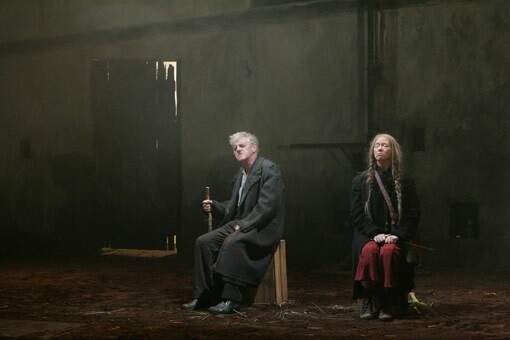 Finally, Synge set the play in his beloved lower glens of Wicklow. Martin and Mary Doul, a blind old couple of the roads, believe themselves beautiful above all others, until a saint restores their sight with water drawn from a well in a ‘place across a bit of the sea, where there is an island’. They are now able-bodied, and must hire themselves out for manual labour to survive. Blindness descends on them once more, and they settle themselves to await a beautiful old age. The saint goes to restore their sight a second time and they refuse. Meeting fierce objections they bow to the second blessing, only that Martin at the final moment upends the can of holy water with a strike of his stick. They embrace a life on the roads, having ‘seen’ the ill-will of those around them. Synge wrote of his play in 1905: ‘I have written this play like a monochrome painting, all in shades of one colour’ and it remained always a favourite of Samuel Beckett’s. The Well of the Saints was first performed at the Abbey on 4th of February, 1905. It was revived at the Abbey on the 14th May, 1908. Both productions were in part supervised by Synge, and in the first production Molly Allgood had a walk-on part, her first at the Abbey, whilst in the second, by then engaged to Synge, she took on the role of Molly Byrne. The Well of the Saints was first published in Dublin and London in editions to coincide with the production in 1905.